In early Anglo-Saxon traditions, the men in the wedding party were referred to as the “Bride’s Knights” instead of the groomsmen. This was because they were responsible for being her protectors before, during, and after the ceremony. Today’s wedding party roles and responsibilities are a bit less…demanding, however, it can be a bit confusing with all the different wedding party roles. Which roles do you pick for your wedding, and who do you give them to? 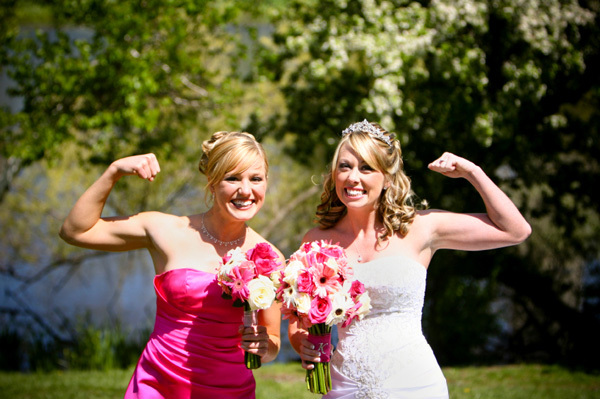 Assign your Maid of Honor as soon as possible. This should be someone extremely close to you. Responsible for the bridal shower and other various wedding day details, like helping the bride get dressed, looking out for the bride’s dress train, and toasting the bride at the reception, the Maid of Honor is probably the most crucial party member to you. She is like a second pair of eyes and hands for the bride, and there to provide you with the emotional support you will need to stay sane during this whole process. Typically the amount of bridesmaids you have will be determined by the size of your wedding. If you are having a large formal wedding, then up to twelve bridesmaids can be acceptable. A smaller, less formal wedding will constitute fewer. As for who you appoint in the bridesmaids positions, they should be your closest gal pals and should be willing and able to help with smaller wedding planning tasks such as stamping wedding invitations and crafting wedding centerpieces, etc. Your hubby-to-be will want to appoint a Best Man. This role is typically responsible for acting as his right-hand guy, advisor, and aid throughout the process. He will most likely be the one responsible for planning the bachelor party, paying the officiant’s fee, making sure the groom is on time for the ceremony, and of course, toasting! Just use your bridesmaids rules for choosing groomsmen; more for larger weddings, fewer for smaller weddings. However, the groomsmen can also double as ushers. This can be handy if you are trying to whittle the wedding party down. Your mother can be responsible for as much or as little as you want. A lot of brides appoint these lovely ladies as their wedding-day contact so that they can relax knowing that “mama’s got it.” Your pops is responsible for footing most of the wedding bill, walking you down the aisle, and most importantly, the father/daughter dance. Once again, the mother of the groom can assume whatever role your man wants her to. She also has the privilege of dancing with her wonderful son during the reception. Your superhero father-in-law is usually responsible for footing the cost of the reception dinner, and trying not to tell every cheesy joke he knows. This is pretty much non-negotiable. You will need an officiant to receive and witness your consent to marry each other so you can be, well…legal! Ok brides, that about wraps it up. How are you narrowing down your wedding party? We’d love to hear from you in the comment section below!